All of my designs are "one-off" originals so that each piece is totally unique. 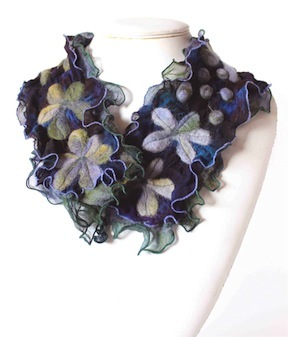 I use mainly hand dyed silks which can't be reproduced again exactly but I can make similar items on request. I choose the printed fabrics that I use carefully to create a vintage style aesthetic but again I make individual pieces rather than reproducing the same item over again. I just LOVE COLOUR. My work is inspired by texture, everyday things I see, images in magazines, galleries, shops, books anywhere can be interesting but I just love to combine colour and pattern in all it's vibrancy or in subtle soft gradations of tone!! !